In America, we take eating very seriously. So seriously in fact, that we need wake up calls from fake made up people. Enter Count Spatula. The International House of Pancakes (IHOP) will be giving away free pancakes this Friday the 28th in the shape of Count Spatula, and as a reminder of this great moment in pancake history, you can visit http://ihop.com/countspatula and leave your phone number. 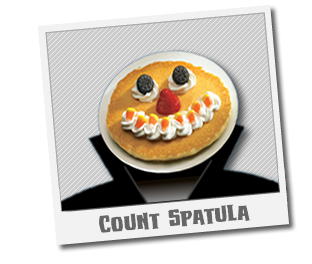 In turn, Count Spatula himself will call you to remind him that its time to come and eat his face. Personally, I'm going to have my Count Spatula with strawberry syrup so it looks like he is messily drinking blood while I slice up his undead face. Is this a new character? He's pretty lame, but I do love when a place has an official character.